The fishing on Lake Texoma the past week started fair but has moved to the good rating as it has definitely started to pick up. I am still using live bait and making long drifts in 30 feet of water. The best fishing is still west of Highport Marina and still in the afternoon. The warming of the water combined with the weather changes these past few days has made the fish more active. As these warmer spring days continue look for even better fishing conditions. Below is a happy couple of "Newlyweds" I fished yesterday. 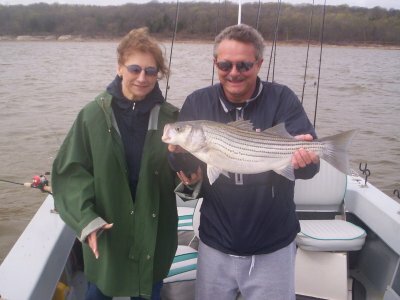 We had a great trip, limiting out with a nice box of texoma stripers. With Daylight Savings time and Spring Break there are many more boats on the water and most of them has children aboard. With all the extra boat traffic on the lake I would like to take the opportunity to remind everyone to be courteous to your fellow fishermen, be extra careful and above all have a great time fishing Lake Texoma.